Please refer to our stock # 21243 when inquiring. Original oil painting on masonite panel by Doris Totten Chase (American, Seattle, 1923-2008). This painting is signed "D.Chase" l.r. It measures 36" by 20" (43" by 27" in its original frame). Provenance: from the Lawrence Alloway estate. A very similar work by this artist is in the collection of the Seattle Art Museum. Doris Chase studied at the University of Washington and with Jacob Elshin, Nickolas Damascus, and Mark Tobey. 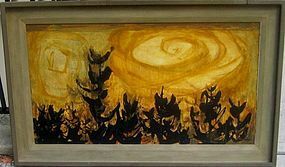 She exhibited in 1956 at the Otto Seligman Gallery in Seattle, later in Italy and Japan (where her paintings were compared to Japanese Sumi paintings). She eventually became known as a sculptor ("Moongates" at the Seattle Center, etc.) and eventually as a video artist (MOMA acquired her complete video and film works.) She was a member of Women Painters of Washington", etc. Bibliography: "Doris Chase, Artist in Motion: from Painting and Sculpture to Video Art", Patricia Failing, 1991; also: "Iridescent Light: The Emergence of Northwest Art" by Deloris Ament, 2002. ROBERT (BOB) MATTHEW FREIMARK, "SEATTLE", 1958 Abraham Mark Datz: "The Challenge/Either Or" Bertha Ballou, "Portrait of Kitty"